Here at Destination I Do, we’re looking forward to spring with the launch of our new Spring 2019 issue, which hits newsstands today! With most of America hunkered down against record-breaking freezing temperatures, let’s look ahead together to warmer weather and sunnier days! While our blog and website are constantly tended with TLC, our magazine is the bread and butter of what Destination I Do is all about. Whether you’re in the process of planning your destination wedding, honeymoon or simply a romantic getaway for two, this issue has something for you. In this issue, you’ll find the trusty departments some of you may have come to count on, as well as some new and exciting features that strive to aide and inspire. For those of you who judge a magazine by the cover, we’re confident you’ll fall in love with our Spring 2019 cover. This real-life bride eloped to beautiful Los Cabos, Mexico. Aboard the 75-foot sailboat Tu Enamorado, our bride was stunning in a two-piece gown by Rminé. Her soft and natural hair and makeup were done by Zoë Elizabeth and the photo shoot creative direction and production was courtesy of Crosby + Jon Design and Grand Velas Project Director, Ary Iturralde. Jeremy Chou shot this on location at the Grand Velas Los Cabos with the help of Carlos Hernandez. The full photo shoot and a behind-the-scenes video by Robert Michael can be found here. If you can make it beyond the glossy cover, you’ll find lots of goodies inside this issue. We’ve got a wonderful batch of features that are unique to the Spring 2019 issue and include a variety of destinations. We explore Latin America with our Latin America is for Lovers feature, which includes highlights of Mexico, Costa Rica and Belize. 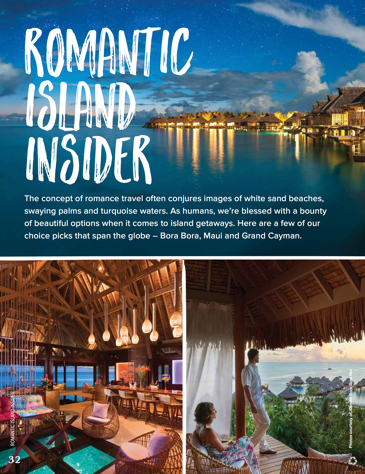 For beach-lovers, check out our Romantic Island Insider that includes reviews of beauties like Bora Bora, Maui and Grand Cayman. Landlubbers and wine-lovers alike will delight in Wine Country with a Twist, which highlights resorts putting a twist on the traditional in destinations like Sonoma, British Columbia and Napa. 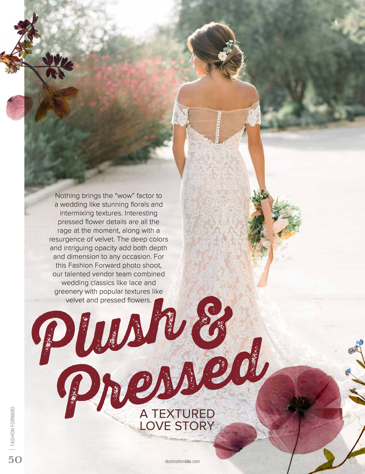 This is just a sampling of this issue’s special features, so you’ll have to pick up a copy to explore and discover more wedding and honeymoon destinations! Last but not least, our Real-Life Weddings section is also back. The pièce de résistance of every issue, these real-life weddings are sure to impress. Discover purple-tinged paradise in California, mountaintop majesty in Colorado, beautiful boho style in Maui, a contrast of colors in South Carolina, a fuchsia fantasy in Maui, a touching family affair in Thailand and beachfront elegance in Los Cabos. Of course, this is just a sampling of what you’ll find between the pages of our Spring 2019 issue. To get the whole scoop, be sure to pick up a copy at your local Barnes & Noble, Target, Safeway, some of the U.S.'s major airports and select newsstands. Can't wait? 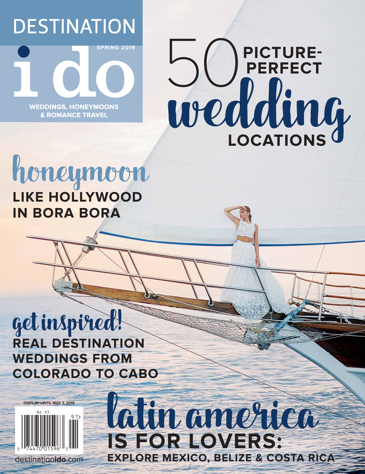 Visit our website to order your issue today or view our digital edition of Destination I Do! As always, we at Destination I Do would like to take a moment to thank each and every person who helped to make this new issue what it is! 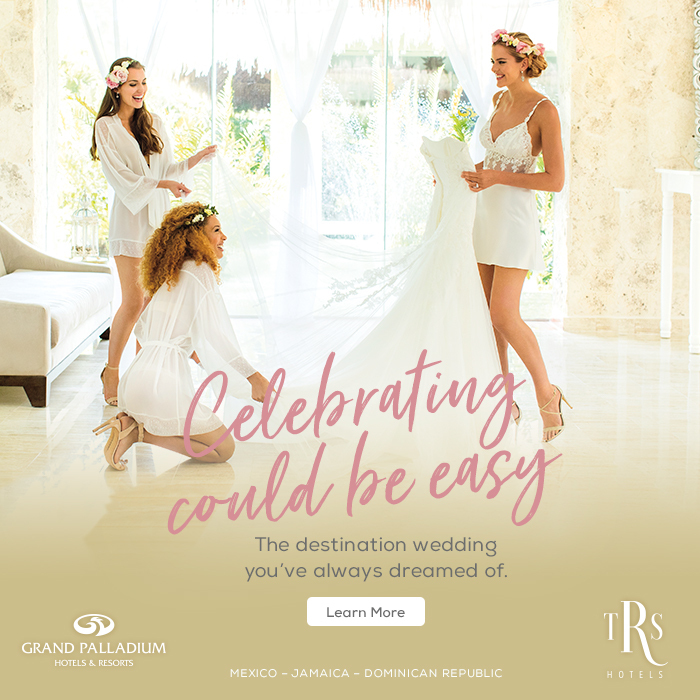 From our real wedding couples, to the talented photographers and creative contributors, thanks for helping us continue to strive to inspire destination wedding couples and romantic travelers the world over! Happy Planning!